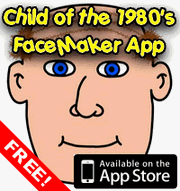 Monster In My Pocket was a series of small collectible plastic monsters first released by Matchbox in 1990, so it’s possible that if you were born during the 1980’s you will remember them. The reason I’m writing about them today is because I was reminded of them after seeing an advert on TV the other night for something incredibly similar – unfortunately I didn’t catch the name of these new ones, but it appears as though Monster In My Pockets are still available now as well. Originally the monsters were made from a rubbery kind of plastic and were available in bright primary colours, a single colour for the entire monster. Later editions added painted details or glow in the dark plastic, and the most recent editions are actually quite intricately painted. They were generally bought in packs of four, although there were special edition ones that were made available in packs of breakfast cereals. The idea behind them was that they could be used as a kind of Top Trumps style game – or at least I think that was the idea. Each monster had a number moulded on it’s back or underside which was it’s point total. I presume that you were supposed to use them to battle with your friends, but I’m not sure of the exact rules. The Monster In My Pocket series was available in both the US and Europe, but it seemed to have more success initially in the UK and Europe than America. They also courted controversy in the UK by the fact that several of the so called monsters were actually Hindu deities, which obviously was deemed to be quite offensive to the people of this religion. The Hindu Gods Kali, Ganesha and Hanuman were all removed from the line up in the UK, although Yama, god of death, wasn’t for some reason. Girl: What’s that in your pocket? 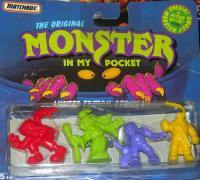 Boy: Monster In My Pocket! Over the years there have also been several spin off toys in a similar vein, including “Super Creepies”, “Space Aliens” and “Dinosaur In My Pocket”. The current version of Monster In My Pocket also includes descriptive game cards for each monster, which broaden the depth of the games that can be played with them. There have also been more girl and younger child friendly ranges such as Puppy, Kitty, Pony and Teddy (all In My Pocket of course). The series has also cross populated into cartoons, video games and comic books. This entry is filed under Toys - Dolls and Action Figures	and was posted on February 5th, 2008. You can follow any responses to this entry through the RSS 2.0 feed. You can leave a response, or trackback from your own site.